Journal of the House of Lords: Volume 2, 1578-1614. Originally published by His Majesty's Stationery Office, London, 1767-1830. To bring Water from Hackney to London, for Supply of Chelsea College. 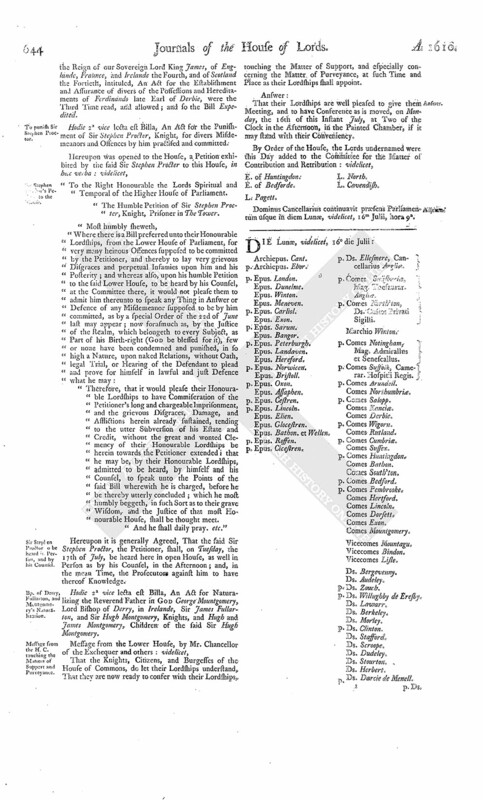 Administration of the Oath of Allegiance and Reformation of Married Women Recusants. An Act for better Safety of the King's Person. For the better Execution of Justice in the North Parts of England. p. Epus. Cicestren. p. Ds. Ellesmere, Cancellarius Angliæ. p. Comes Salisburie, Mag. Thesaurar. Angliæ. p. Comes North'ton, Ds. Custos Privati Sigilli. p. Comes Notingham, Mag. Admirallus et Senescallus. p. Comes Suffolk, Camerar. Hospitii Regis. p. Ds. Willughby de Eresby. p. Ds. Howard de Walden. HODIE (fn. 1) 2a vice lecta est Billa, An Act for the bringing of Fresh Streams of Water, by Engine, from Hackney Marsh, to the City of London, for Benefit of the King's College at Chelsey. L. Bp. of Rochester. L. Zouch. Mr. Dr. Amye, To attend the Lords. Appointed to meet To-morrow Morning, at Eight of the Clock. Hodie 2a vice lecta est Billa, An Act for administring the Oath of Allegiance, and Reformation of Married Women Recusants. Sir Mathew Carew, To attend the Lords. Appointed to meet on Wednesday, the 18th of July, by Eight of the Clock in the Morning, in the Little Chamber, near the Parliament Presence. Hodie 2a vice lecta est Billa, An Act for the better Safety of His Majesty's Royal Person. Mr. Dr. Hone, To attend the Lords. Appointed to meet on Tuesday, the 17th of July, by Eight of the Clock in the Morning, in the Parliament Presence. Hodie 3a vice lecta est Billa, An Act for the Relief of John Holdich, Gentleman, disinherited by the extraordinary amending of the Errors of a Fine. 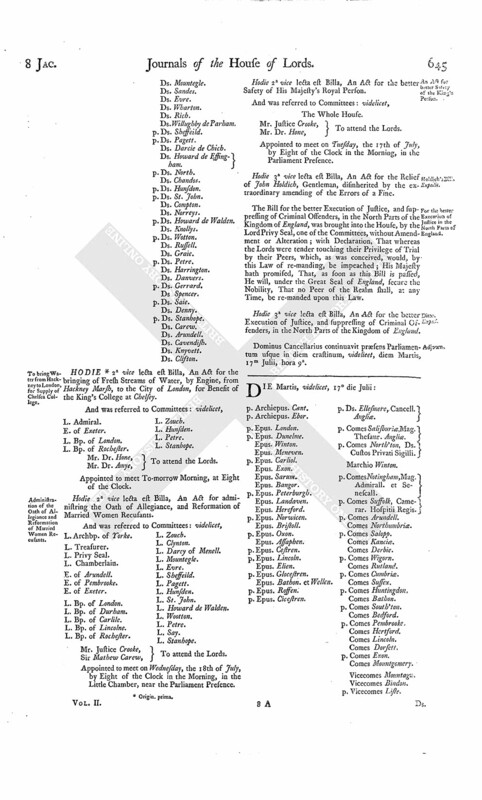 The Bill for the better Execution of Justice, and suppressing of Criminal Offenders, in the North Parts of the Kingdom of England, was brought into the House, by the Lord Privy Seal, one of the Committees, without Amendment or Alteration; with Declaration, That whereas the Lords were tender touching their Privilege of Trial by their Peers, which, as was conceived, would, by this Law of re-manding, be impeached; His Majesty hath promised, That, as soon as this Bill is passed, He will, under the Great Seal of England, secure the Nobility, That no Peer of the Realm shall, at any Time, be re-manded upon this Law. Hodie 3a vice lecta est Billa, An Act for the better Execution of Justice, and suppressing of Criminal Offenders, in the North Parts of the Kingdom of England. Dominus Cancellarius continuavit præsens Parliamentum usque in diem crastinum, videlicet, diem Martis, 17m Julii, hora 9a.